Mrs Healy teaches Robin Class throughout the week. Mrs Hiscock supports Robin class. This term, children in Robin class will have an opportunity to participate in ‘Presentation Time’ every Friday. Some Year 3 children took part in ‘Presentation Time’ last year, but this will be a new activity for the Year 2 children. This will involve them choosing a subject that they are interested in and talking about it with their peers for up to 10 minutes. In English, children are encouraged to be competent in the arts of speaking and listening and this opportunity provides them with a dedicated time to practise these valuable skills. The subject of the presentation is up to them. It might be that they want to talk about a sport that they participate in, something that they love to do at home, pets that they help to look after, the list is endless! Your child can bring in objects related to their presentation for the rest of the class to look at and I will ensure that they get these back at the end of the day. They will be asked to ‘sign up’ on the presentation clipboard. Children will get a slip to let them know the date of their presentation. I will be encouraging Year 3 children to sign up first so that they can demonstrate. In the past I have found that children have always been very keen to participate, but please let me know if you need further clarification or have any concerns. This should be fun and not stressful! I look forward to hearing all about your child’s interests during their presentation. 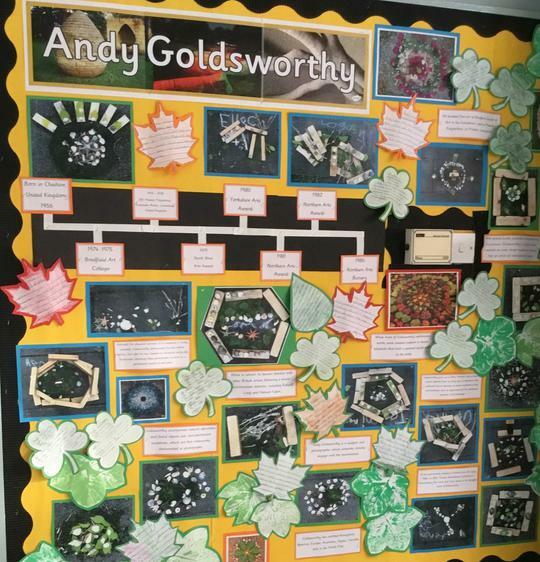 Art produced by the pupils from Robin Class in response to the work of Andy Goldsworthy. The children had great fun collecting the resources they needed for their masterpieces from the school grounds.